Thoracoscopic T2–T3 sympathectomy is the treatment of choice for primary palmar hyperhidrosis (PPH); however, compensatory hyperhidrosis (CH) is a disturbing sequela of this operation, the mechanism of which is poorly understood. 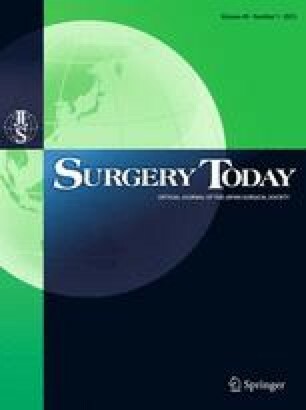 This study was conducted to evaluate the effect of heat stress on total body perspiration after thoracoscopic T2–T3 sympathectomy, and determine its correlation with CH. A total of 17 patients with PPH who underwent bilateral T2–T3 sympathectomy were subjected to heat stress induced by a 10-min sauna bath (ambient temperature 70°C), 1 day before and 1 month after surgery. The naked body weight was recorded before and immediately following the sauna bath, and the patients were followed up to assess whether CH had developed and the degree of its severity. Postoperatively, the amount of perspiration increased in 13 patients and decreased in 1. The amount of perspiration induced by the sauna bath ranged from 60 to 480 g, with a mean value of 185.29 ± 125.80 g, before the operation, and from 60 to 540 g, with a mean value of 265.88 ± 154.05 g, after the operation (P = 0.0113). There was no correlation between the degree of alteration in total body perspiration and the development of CH. Performing thoracoscopic T2–T3 sympathectomy for PPH affects the total body sweating response to heat; however, the development of CH does not correlate with this alteration.